In this quickstart, you will use Microsoft Intune to require your workforce's Android users to enter a password of a specific length before access is granted to information on their Android devices. 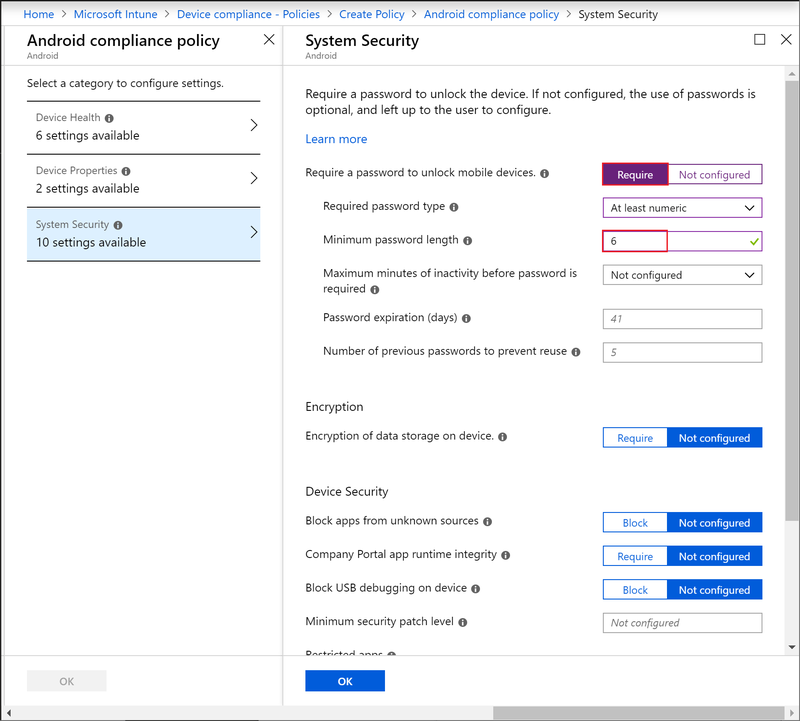 An Intune device compliance policy specifies the rules and settings that devices must meet to be considered compliant. You can use compliance policies with conditional access to allow or block access to company resources. You can also get device reports and take actions for non-compliance. In addition to password settings, you should also consider other system security settings to protect your workforce. For more information, see System security settings. Sign in to the Intune as a Global Administrator or an Intune Service Administrator. For this quickstart, you'll use Intune to require your workforce's Android users to enter a password of a specific length before access is granted to information on their Android devices. In Intune, select Device compliance > Policies > Create Policy. Add Android compliance as the Name. Also, add a Description. Select Settings > System Security to display the Android System Security blade. Click Require next to Require a password to unlock mobile devices. Select At least numeric next to Required password type. Enter 6 next to Minimum password length. When done, click OK > OK > Create to create the policy. When you've successfully created the policy, it will appear in your list of device complice policies. When no longer needed, delete the policy. To do so, select the compliance policy and click Delete. In this quickstart, you used Intune to create a compliance policy for your workforce's Android devices to require a password of at least six characters in length. For more information about creating compliance policies, see Get started with device compliance policies in Intune.